Broken glass security door at Christian Liberty Academy. Arlington Heights police responded about 7:53 a.m. Saturday to a report of a burglary at Christian Liberty Academy, 502 West Euclid Avenue. Police received a report of a break-in to the east side of the building with criminal damage to an interior drinking fountain on the east side of the building. Bricks were also used to smash two windows and two glass security doors. Either a lone offender or an offender part of a planned protest at the school Saturday night is suspected of committing the criminal damage. A Saturday night banquet has been planned for month by “Americans For Truth About Homosexuality.” The group is using the school’s facilities to feature speeches with information about homosexual agenda. 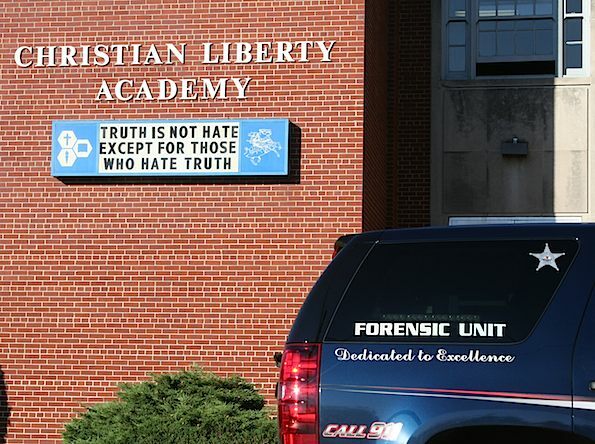 Police remained on the scene at Christian Liberty Academy all day Saturday after criminal damage to property and burglary was reasonably connected to a protest of speaker Rev. Scott Lively, who is visiting the school Saturday night. 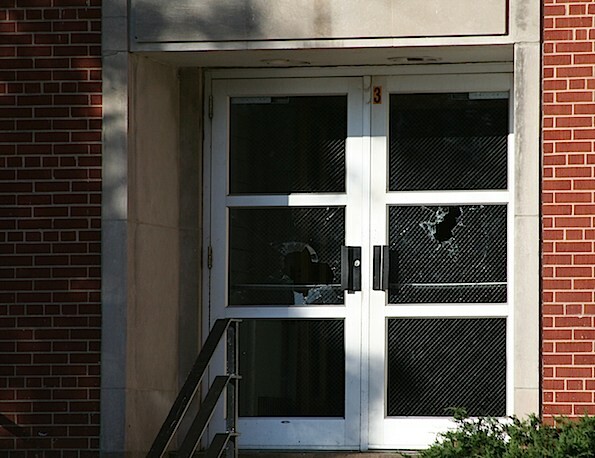 An unknown vandal or vandals threw a bricks through two doors and two windows on the east side Christian Liberty Academy at a location of the building almost aligned with Mueller Street at Walnut Avenue. According to a WordNetDaily.com article, at least one of the bricks was inscribed with the words “SHUT DOWN LIVELY” … the brick included a note theatening more violence if the church and school didn’t stop hosting such “homophobic” guests. Also, according to World Net Daily, a “press release” was sent to three e-mail accounts: AFTAH President Peter LaBarbera, Christian Liberty Pastor Calvin Lindstrom, and the Chicago Independent Media Center. “In the early morning hours of October 15th, we put two chunks of concrete through the glass windows and doors of the Christian Liberty Academy,” claims the author of the release, identifying himself only by a vulgar nickname. “We did this because at 6 p.m. today they will be hosting an event organized by the homophobic hate group Americans For Truth About Homosexuality, that [sic] will be presenting an award to Scott Lively. According to its website, The Independent Media Center (“indymedia” for short) is a grassroots organization committed to using media production and distribution as a tool for promoting social and economic justice. It is a cooperative effort of hundreds of independent media organizations around the world, some of whose efforts you can visit via the list of worldwide indymedia centers on the left-hand column of this webpage. Scott Lively is a noted activist against homosexuality and the president of Abiding Truth Ministries, a conservative Christian organization located in Temecula, California. Abiding Truth Ministries is classified as a hate group by the Southern Poverty Law Center. Lively has called for the criminalization of “the public advocacy of homosexuality” but has advocated that homosexuals be “left alone” if they keep their lifestyle private. Arlington Heights police took precautions immediately after the report of criminal damage, apparently before they were aware of the alleged ‘press release’ that was sent later. Police searched the building for any offenders that may have remained hiding in the building after the break-in. Cook County Bomb Squad enters the Christian Liberty Academy, apparently to sniff for explosives. 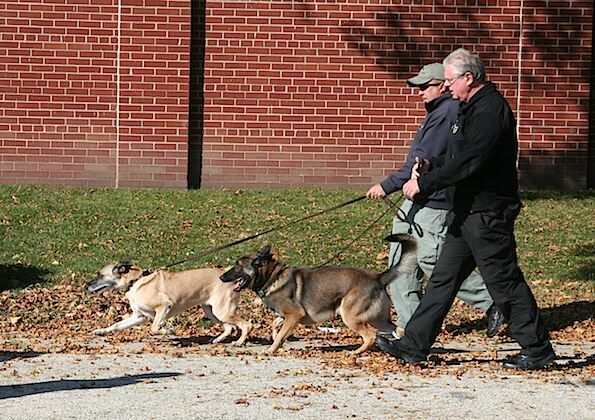 The Cook County Bomb Squad also checked the building thoroughly with two bomb-sniffing dogs strictly as a precaution, due to the threatening nature of the otherwise criminal damage incident. Police and Christian Liberty Academy officials made no statement that any specific explosive threat was known or expected. Police remained at the scene all day Saturday to protect against any further threats. Police will remain on the scene during a planned protest by the Chicago-based Gay Liberation Network, who are expected to protest while an AFTAH banquet is held inside the Christian Liberty Academy building.